Accurately determine wind speed based only on your own observations. This poster shows you how. Admiral Sir Francis Beaufort was a hydrographer and top administrator in the British Navy. Sea captains used different terms to describe wind conditions, so in 1805, Beaufort established a standard scale. It has continually evolved. 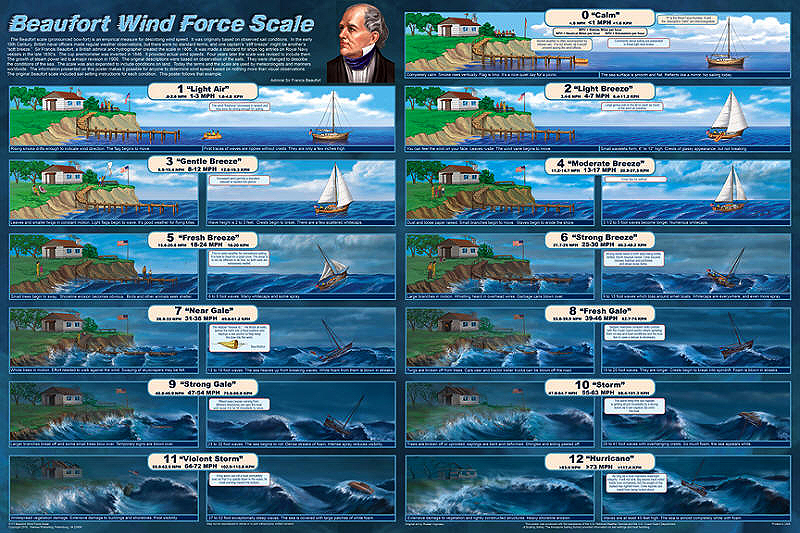 This poster cites the official description of each wind force, but it goes beyond that to show how wind impacts both land and sea. The dramatic illustrations show increasingly powerful winds and waves destroying a summer beach cottage and tearing off large sections of the cliff, severely eroding the shoreline. The terrifying sea conditions really put the little sloop in harm’s way. Knowledge of these visual standards makes it possible for anyone to determine wind speed based solely on observation, just like the master mariners of yesteryear. This is the first time that this important information has ever been presented in such detail in any medium. It is an essential reference chart for meteorologists, seamen, or anyone else who wants or needs to know how to identify weather conditions. Admiral Beaufort’s original scale included sail setting guidelines for British ships, so we followed his example using a 40-foot sloop, typical of one used by modern day recreational sailors. Insets suggest sail settings, boat handling recommendations, and safety precautions for each wind force. As the wind force increases, the boat is really battered. In fact, it is actually rolled over. If properly ballasted and watertight, it will right itself. Of course, the crew is badly shaken.